If you choose to tackle the path with your own feet or ascend via cable car (we did both, but chose not to ride a donkey) beware of donkey droppings and hoof encounters with the first option, and potential vertigo spells with the second one. We saw one tourist whose foot was accidentally stepped upon by a donkey’s hoof, and the woman exclaimed how painful that was. We found the walk to be great exercise. The cable car ride, on the other hand, offered a beautiful view of the caldera and cliff, albeit quite quick! That is a lovely idea! A travel charm bracelet… love it. Given their diminutive size, the charms are the perfect souvenir. I’ve now graduated onto my second bracelet. The backlighting makes for a great photo! I like the “where in the world” graphic. 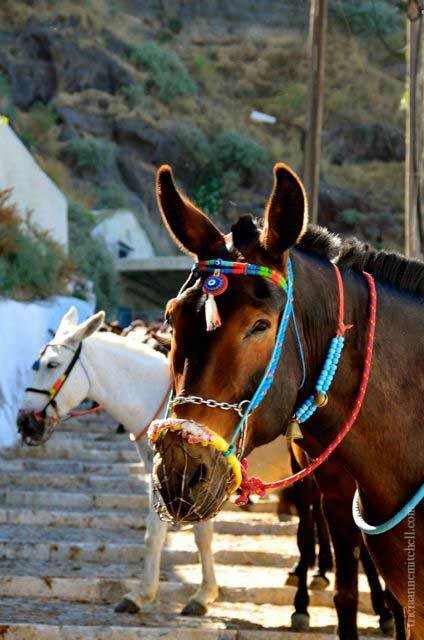 This trip uphill via donkey sounds challenging. My favorite mode would be to hike, if there was a path. Love your photograph, Tricia! Elisa, it was a challenge we didn’t take on as we felt we needed exercise more than the donkeys did. :) If you head to Santorini someday, you’ll be pleased to see there is a path with about 600 stairs. We climbed down it, then rode the cable car up on the way back, following a long day’s excursion to the nearby volcano. Cutest donkey. Smart and intelligent but patient. Vera, and strong too. I’m amazed that they can not only carry so many agricultural goods, but also heavy humans. Kudos to you for not riding the donkeys, Tricia. I can’t imagine what they endure every day; the photos on the petition site you linked to were awful. :( I rented an apartment in Crete when I visited there. The couple who run the place volunteer with donkey rescue groups in Greece. Apparently donkey abuse is a widespread problem there. Ruth, it felt like the right decision for us not to ride one. When I was doing research for this post, I was happy to see that attention was being drawn to the issue, and that some philanthropists had started nonprofits, and potentially that there was another cable car’s construction in the works. How long were you on Crete? After spending some time in Santorini, we turned into history nerds, learning about the Minoan civilization. Did you see Knossos? I bet it’s fascinating! I would definitely take the cable car up and the stairs down. Much easier that way.